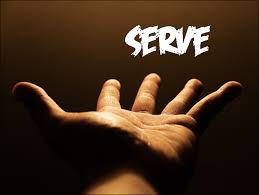 On Wings of Eagles: What Does God Say About Serving? 43 But it shall not be so among you. But whoever would be great among you must be your servant, 44 and whoever would be first among you must be slave of all. 45 For even the Son of Man came not to be served but to serve, and to give his life as a ransom for many. Do you run to get "first dibs" on the front seat of the car when piling in for carpool? How does it feel to be first in line when you are hot and thirsty? Jesus had some curious things to say about first and last. In the Bible, two brothers asked Jesus for a big favor. They wanted special seats, one on the right and one on the left of Jesus’ throne after He was anointed King! They said, “Let one of us sit at your right and the other at your left in your glory” (Mark 10:37). The other disciples heard about it, and they were mad. Maybe they wanted the best seats, too! Jesus decided to gather them all together to talk about it. How did He answer them? In God's kingdom, the servant is the greatest. How does Jesus want you to serve others? Here are some ideas! Rake leaves for elderly neighbors or help them with trash. In the lunch line, let others go ahead of you instead of wanting to be first. Help a coworker with their backpack. Do one of your chores before you are reminded. Take out all the garbage in the house. Dear Lord, thank You for teaching us how to serve. Help us forget about me and to start thinking about others. Thank You for the ways our family, teachers and leaders in our church show us how to be a servant-leader too. Help us to encourage others to be great leaders. In the Name of Jesus, Amen. Labels: What Does God Say About Serving?